The king is dead. Long live the king. Which is it? Is the man ruddy dead or alive? In this, the second decade of the 21st century, the very same might be asked of CD players. The younger generation is now used to stealing music from low-rez sources (translated: they don't pay for their music). They no longer know of CDs. For them it's MP3 exclusively. Even those who do pay for their music often prefer a €30/month subscription fee for unlimited access to lossless streaming à la Qobuz, Tidal and Deezer Elite. For the price of two CDs, they can listen 24/7 to 10s of 1'000'000s of songs and do so at 1'411 not 320kbps. Who still needs a CD player? Just as the death of vinyl was announced prematurely, so the advent of streaming didn't magically wipe out the billions of CDs already sold. Whilst current sales of 2-channel silver discs are way down, should we assume that everyone with large collections has transitioned to USB/Ethernet audio? That entails the potentially grueling grind of importing and tagging 1'000s of titles to NAS/PC/MAC/other memory, then dealing with some form of computer to play them back. Are all CD users actually up for that? A number of hifi companies are not betting their farm but at least one dedicated model on the contrary assumption. Legacy audiophiles particularly with large CD collections may be averse to PCfi for any number of reasons. And with CD drives destined to failure just like hard drives, there would seem to be ongoing if shrinking demand for machines which can spin physical discs. Note the deliberate phrasing. I didn't say CD players. I said machines which can spin CDs. To not merely pursue a shrinking market but tap into the vast majority who need a DAC, a modern CDP with legs—industry talk for long-lived sales—must at minimum add outside access to its internal converter. That has to include USB. Preferably it won't stop there but add analog volume control. Even better, it will add analog inputs to cover the bases. Better still, it offers a modular option menu so buyers may configure the machine and thus only pay for the features they want. 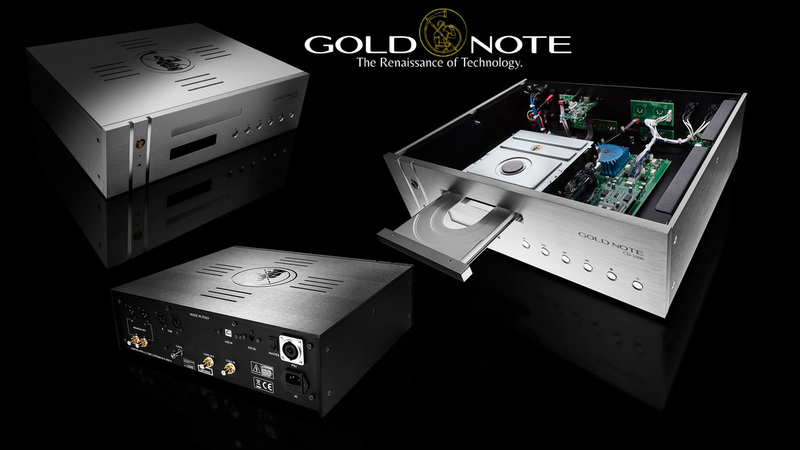 Which arrives us at the Italian Gold Note CD-1000. It's all that and more. My review won't get into the more which could be: massive 6- and 12-tube external output stages; 100/250-watt outboard "super inductive" power supplies; and Cesium or Rubidium external atomic master clocks. Instead we'll inspect the fully loaded €5'700 one-box option. That contains an Austrian Stream-Unlimited JPL2580 drive. It does coax/Toslink via AKM receiver and 24/192 USB via XMOS XS1-L1 transceiver. All digital data are processed by dual-mono PCM1792A converters and spit out as 2/4Vrms on RCA/XLR via a fully balanced transistor output stage. The €1'900 extras of the review loaner above the base configuration are the analog preamp functionality via PGA-based dual-mono volume control; plus one XLR analog input. This lot is encased in a beefy 43x13.5x37.5cm WxHxD chassis of 15kg that was designed by architect Stefano Bonifazi. It may be had in clear or black anodized brushed aluminium whilst two decorative front-panel 'speed stripes' can be acrylic, Walnut or aluminium. If you drew a blank on Gold Note the brand, you may have heard of them as Bluenote, Black Note or Goldenote. As though colorblind, this Firenze-based company has been through many iterations but seems to have finally settled down*. And gold is certainly shinier than a shiner in black or blue. Which returns us to the opener. What should one call the CD-1000? A CDP/DAC/pre? A disc spinner with DAC? A DAC with disc spinner? The obvious answer is, whatever you like. Depending on intended usage, you could treat it as a DAC that happens to accept discs for the rare occasions that visitors bring some. You could treat it as a CD player that's future-proofed should you or yours embrace streaming. You could treat it as a one-box source solution to drive your amp/s directly. You could even connect one legacy analog source like a tuner. And to go all out, you could seriously tube-fi the deck, beef up its power supply and/or upgrade its reclocking each in two stages. Despite its disc drive pointing at the past, such comprehensive modularity points fiercely into a future whose favourite term is multi-tasking. And inherent in that is the promise of non-obsolescence. This machine will adapt not only on features but scale up performance to keep growing. And as long as one keeps growing and learning, one is anything but dead, king or not. Long live the CD-1000? * "BlueNote and BlackNote are part of our 20-year heritage to represent a different era of the company when we were an OEM. During those years we adopted a low profile and used those brands to showcase the performance of our products. It's something we still do. Take a look at Bryston's new BLP-1 turntable for a fresh example we can mention since Bryston never kept it secret whilst we have NDA with other manufacturers. The CD-1000 is part of the 1000 line which also includes the DS-1000 streamer, P-1000 preamp and PA-1175 power amp. Our remote is custom made by Ruwido who also produce for for Linn, Naim and McIntosh."